In the last month or so I’ve been in no fewer than four restaurants where mashed avocado on toast was featured on the menu. Generally completely as is, but with maybe some red pepper or lime sprinkled over top. Minimalist. Pure. Perfect. And around eight bucks a pop. 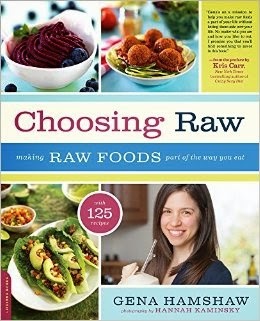 In the absence of enzyme theory, it makes sense to ask why anyone would bother eating raw food. My answer is that the benefits of raw food go far beyond the enzymes! Raw foods are hydrating, rich in fiber, and full of antioxidants. They’re innovative, colorful, crisp and fresh. Because this is a new field for many, Hamshaw includes a FAQ section as well as one on myths and misconceptions. There is also a section on setting up the vegan kitchen. And those just getting started on a raw or vegan lifestyle will find the author’s 21 day meal plan especially helpful as it can act as a roadmap to what can at first seem like a very new and different way of life. The Bulk of Choosing Raw, however, is given up to what we stood in line for: the food. Hamshaw starts us off with basics: hand made almond milk. A basic green smoothie. Cashew cheese. And then recipes from every part of each day and meal. A few favorites: the Raw Pad Thai is based on kelp noodles, cabbage and a lot of traditional flavors. And Hamshaw’s Pumpkin Quinoa Risotto with Pomegranate Seeds is more than a nod at traditional risotto. And for those vegans who are missing their dairy, the Cashew Banana Yogurt is a satisfying and healthful alternative. At lunchtime, the Dilly Raw Vegan Sunflower “Tuna Salad” provides a great sandwich filler and the Raw Lasagna kind of really isn’t, but it IS delicious.